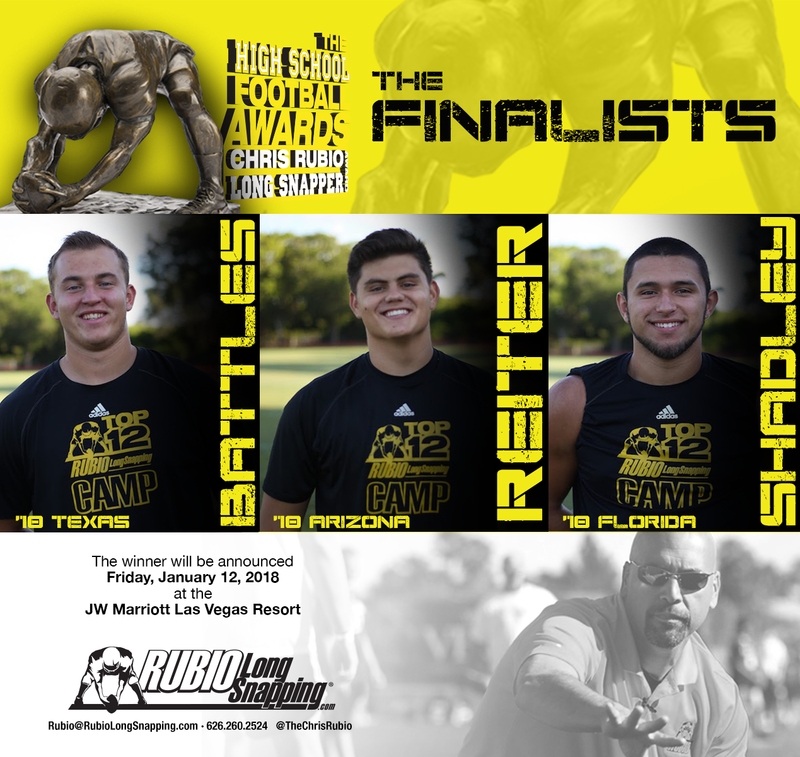 Here are the Finalists for The Chris Rubio Award! 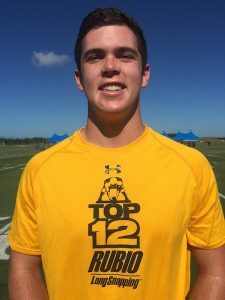 All information must be sent to Rubio@RubioLongSnapping.com by noon pst on Friday, December 29th. A panel of voters assembled by the Chris Rubio selection committee will be voting. The panel will include: Chris Rubio, past and current NFL Long Snappers, past and current NCAA Long Snappers, past winners of the Chris Rubio Award (once they graduate from college), and Sports writers and columnists. Mid December: Ten Semi-Finalists will be announced. Late December: The Three Finalists are announced. The overall winner will be determined by total votes. 3 points (1st Place Vote), 2 points (2nd Place Vote), 1 Point (3rd Place Vote). In the case of a tie, Chris Rubio will break the tie with his vote. January : The winner will be announced in Las Vegas on Friday, January 12, 2018 at the JW Marriott. The winner will be determined by total votes. 3 points (1st Place Vote), 2 points (2nd Place Vote), 1 Point (3rd Place Vote). This year, we are adding in a popular vote on a Twitter poll. The Long Snappers who wins the poll, will earn an additional first place vote! 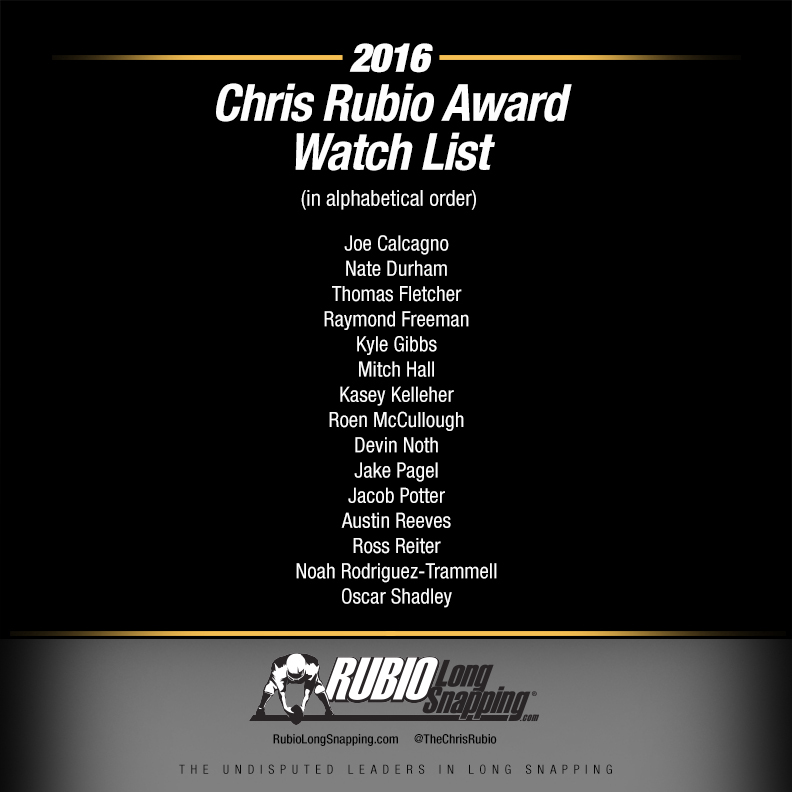 Here is the Semi-Finalists List for The Chris Rubio Award! 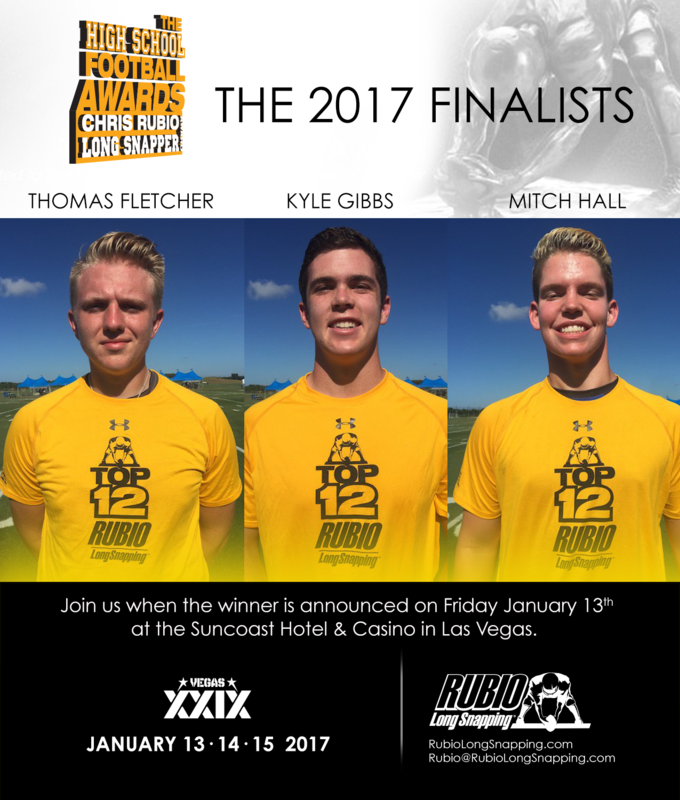 These semi-finalists have less than one week to send in a one minute highlight video and one letter of recommendation from their head coach. Both must be submitted to Rubio@RubioLongSnapping.com by Wednesday, December 20th at noon pst. Every athlete that plays high school football at the varsity level, regardless of state division, or age. 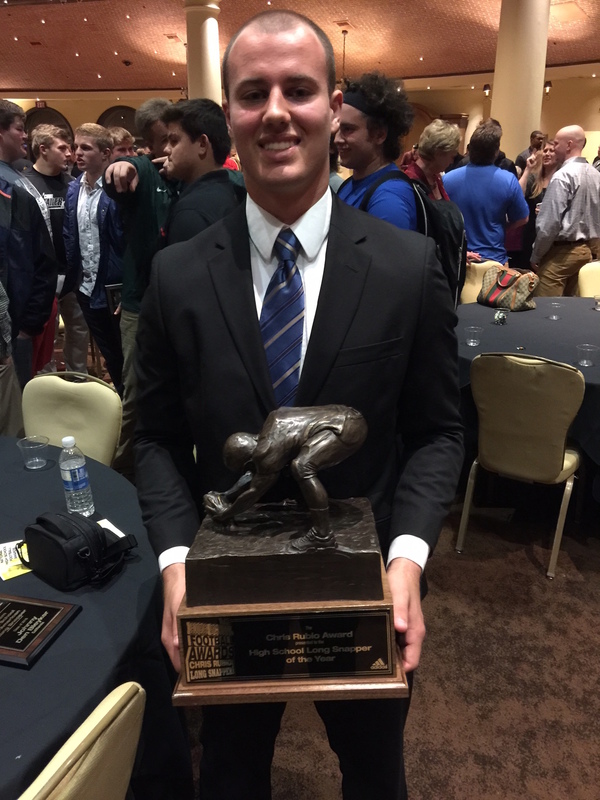 You DO NOT have to attend a Rubio Long Snapping camp to win this award. Late December: The Three Finalists are announced. The Finalists will be determined by total votes. 3 points (1st Place Vote), 2 points (2nd Place Vote), 1 Point (3rd Place Vote). In the case of a tie, Chris Rubio will break the tie with his vote. January : The winner will be announced in Las Vegas on Friday, January 12, 2018. The winner will be determined by total votes. 3 points (1st Place Vote), 2 points (2nd Place Vote), 1 Point (3rd Place Vote). Now is when it will really get intense. Each finalist has the option of doing the following…. sending in a two minute highlight tape explaining why they should be the next recipient of The Chris Rubio Award. Tape can include snapping highlights, personal interviews and even a first hand interview of the finalists. This will need to be uploaded to YouTube with the title = NAME, Chris Rubio Award Finalists, 2015. All information must be sent to Rubio@RubioLongSnapping.com by 10 pm pst on Friday, December 18th. The winner will be selected by the Awards Committee and presented with the trophy on Friday, January 15th at 7:00 pm at the JW Marriott in Las Vegas, NV. 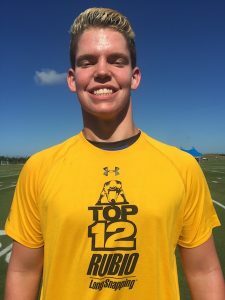 Former top ranked (class of 2008) Rubio Long Snapper Aaron Brewer has just signed a four year contract extension the Denver Broncos. This will be Brewer’s fourth year with the team and he is expected to make $4 million dollars with a $740,000 signing bonus! Brewer is also a member of the selection committee for The Chris Rubio Award choosing the top high school Long Snapper in the country. Funny story is that when Brewer was a junior in high school, I remember speaking with his father after a lesson. It went something like this…. sending in a two minute highlight tape explaining why they should be the next recipient of The Chris Rubio Award. Tape can include snapping highlights, personal interviews and even a first hand interview of the finalists. This will need to be uploaded to YouTube with the title = NAME, Chris Rubio Award Finalists, 2014. 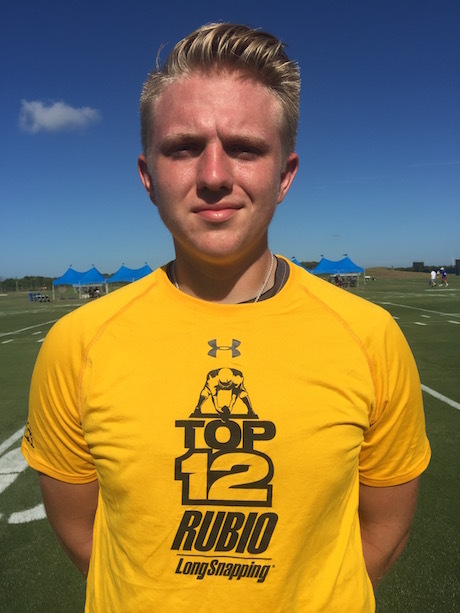 All information must be sent to Rubio@RubioLongSnapping.com by December 19th. The Chris Rubio Award is presented, on an annual basis, to the best national high school Long Snapper for that given season. Past winners include Scott Daly of Notre Dame (2011), Cole Mazza of Alabama (2012) and Blake Ferguson (committed to LSU). This past weekend was the Herbalife 24 Chris Sailer and Chris Rubio Awards for top high school Placekicker and Long Snapper. 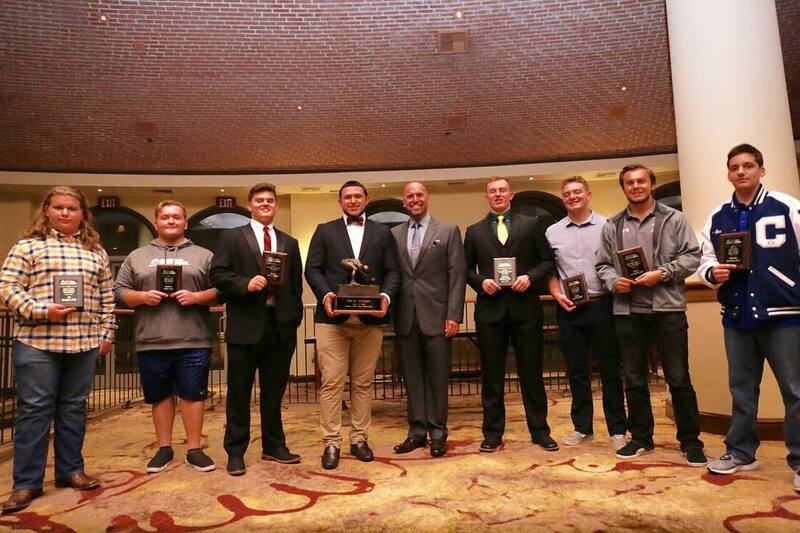 Three kickers and three long snappers were brought into L.A. Live for the awards show. 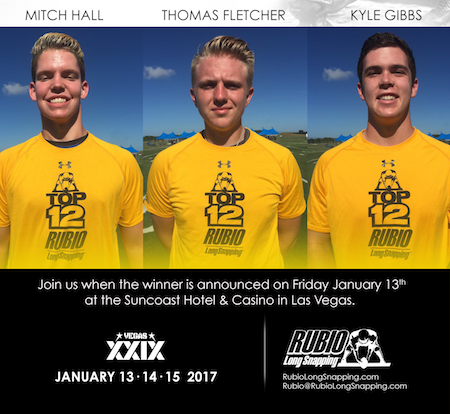 The three finalists for the Chris Sailer Award for top Placekicker were Austin Rehkow (WA, ’13), Kevin Robledo (CA, ’15) and Wyatt Schmidt (MN, ’13). The three finalists for the Chris Rubio Award for top Long Snapper were Cole Mazza (CA, ’13), Gabriel Miller (IN, ’13) and Scott Sypniewski (IL, ’13). The weekend started off with the finalists that were flown into LAX being picked up in limos and driven to the JW Marriott. Once there, they, and a guest of their choice, relaxed in their rooms and waited for dinner at the ESPN Zone. The first night’s dinner was casual with everyone getting to know one another and to finally see the trophies they worked so hard to hopefully take home the next day. Saturday started off with a breakfast at the Herbalife building with a presentation on nutrition and supplements. Following the breakfast, the finalists, along with Chris Sailer and Chris Rubio, were driven in a limo to Saddle Ranch restaurant on Sunset Blvd. Needless to say, they ate and ate and ate some more. At 6:00 pm, the Awards show officially started in the Herbalife building at L.A. Live. Everyone in attendance was formally dressed, looking sharp as the tension filled the air. Master of Ceremonies Wayne Cook of Fox Sports West did a tremendous job as he brought up guest speakers and conducted interviews with the finalists on stage. 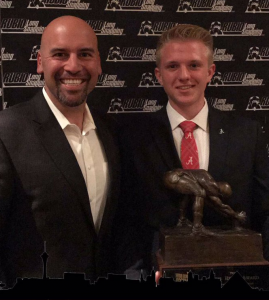 After much adieu, the winner of the Chris Rubio Award for top high school Long Snapper in the country was presented to Cole Mazza and the winner of the top high school Placekicker in the country was presented to Wyatt Schmidt! 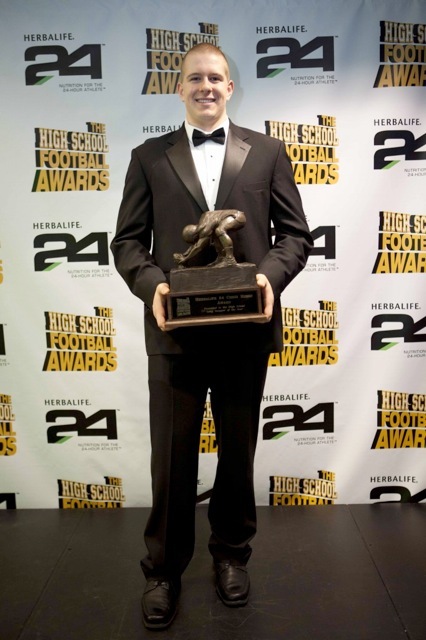 Well, the big announcement has been made and now you all know about The Chris Rubio Award presented by Herbalife 24. The world of Long Snapping will be changed forever. Never has a Long Snapper been honored to this degree at the high school level (or college level for that matter). THIS IS HUGE! I gathered you might be a bit confused, so I decided to clarify it a bit for you. Of course, you can find out all the information on the actual website here, but I wanted to double it up for you. Similar to the Heisman, in that it will be given out every year and there will be two trophy’s. One trophy will go home with the winner and one will stay with Herbalife. The trophy (look up and to the right) stands approximately one foot tall, weighs 30 lbs. and is bronzed (the one you see on the picture/website is just the clay mold of it, new photo coming soon). There will be a ceremony at the Herbalife Banquet Hall in LA Live (right next to Staples Center) highlighting the three finalists. The three finalists and one parent will be flown to Los Angeles, CA and put in a hotel for the weekend (Dec 17) by Herbalife. You must be an athlete that plays high school football at the varsity level, regardless of state division, or age. 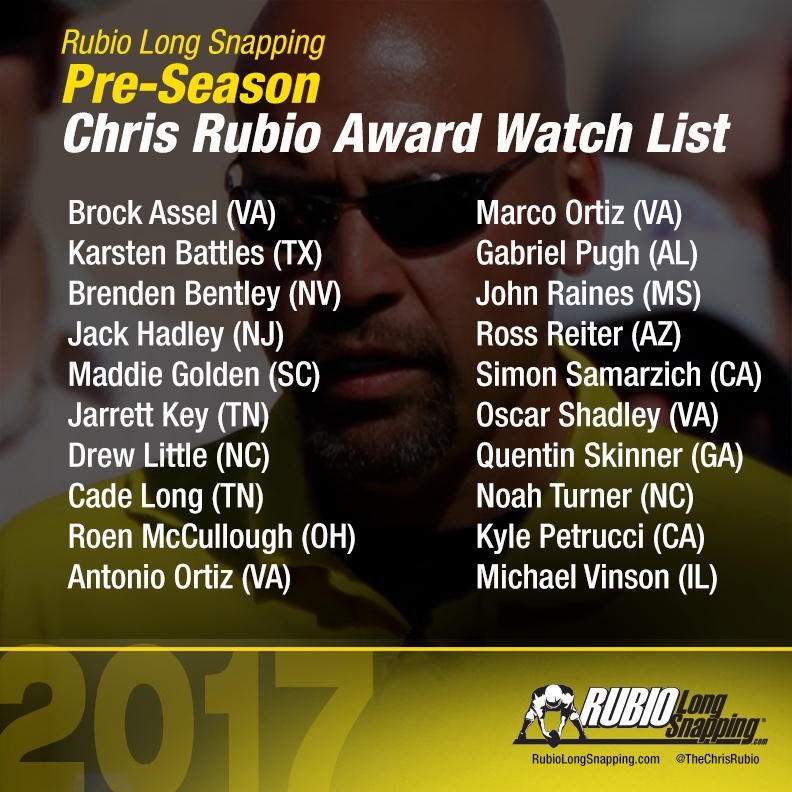 You DO NOT have to attend a Rubio Long Snapping / Chris Sailer Kicking camp to win this award. You will notice there is a watch list already of the top Long Snappers in the country. You do NOT need to be on this list in order to win. The list can adjust over the time frame. You must be the starter for your high school varsity team. 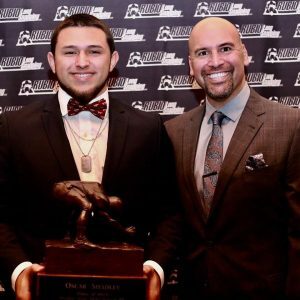 To qualify, you may be viewed by Chris Rubio in person, send in film, have a high school head coach’s recommendation, college special team’s coach recommendation or sports writer’s recommendation to be considered eligible. A panel of voters assembled by the Chris Rubio selection committee will vote for the winner. A panel of voters assembled by the Chris Rubio selection committee will be voting. 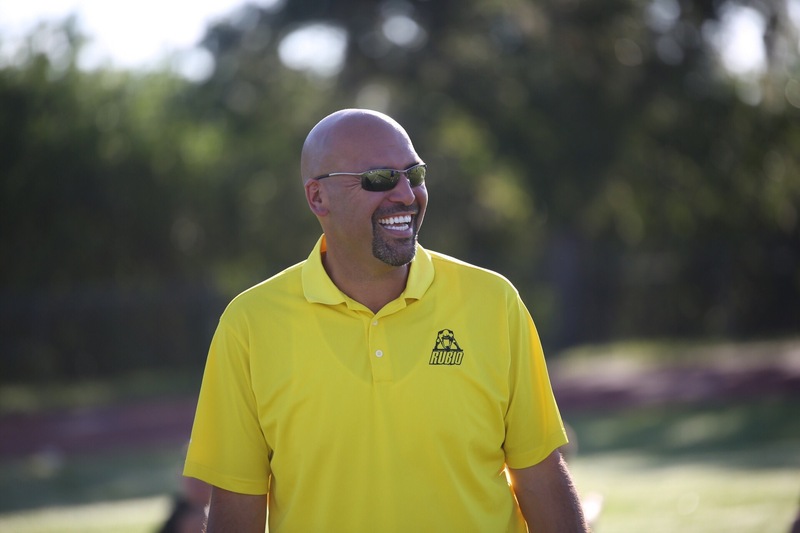 The panel will include: Chris Rubio, Herbalife representatives, past and current NFL Long Snappers, past and current NCAA Long Snappers, past finalists for the Chris Rubio Award, and Sports writers and columnists. Therefore, if you are one of the final three for the award, you will be on the voting committee forever. 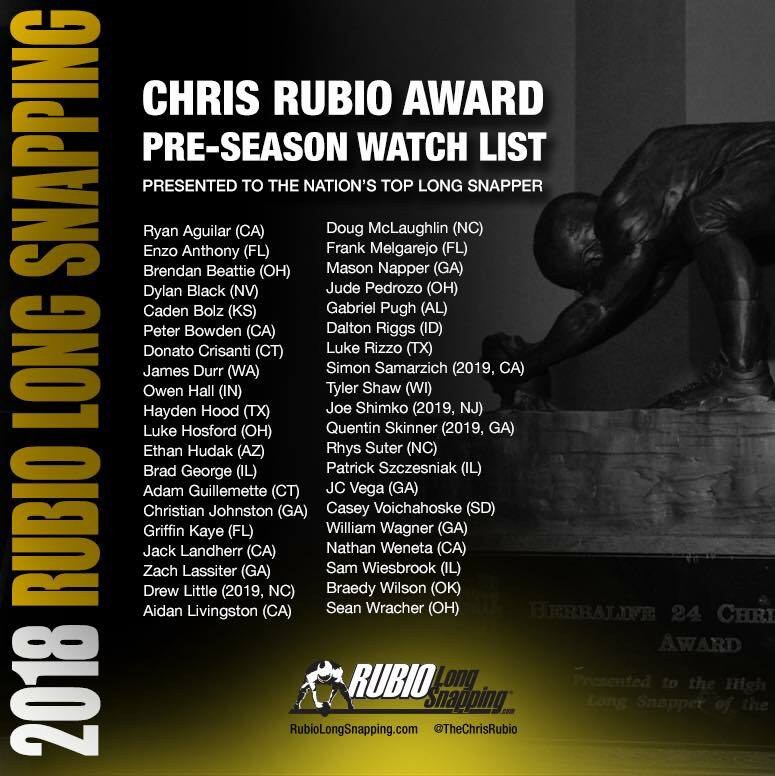 Last Week of September: A watch list will be announced highlighting athletes that have been recognized as a top Long Snapper through this part of the season. The eventual winner does NOT have to be on the watch list to win the award. This is a simple recognition of those that are in the lead. November 21, 2011: Three Finalists are announced. The finalists will be determined by total votes. 3 points (1st Place Vote), 2 points (2nd Place Vote), 1 Point (3rd Place Vote). In the case of a tie, Chris Rubio will break the tie with his vote. December 17, 2011: The winner will be announced at the Herbalife Banquet Hall at L.A. Live in Downtown Los Angeles, CA. The winner will be determined by total votes. 3 points (1st Place Vote), 2 points (2nd Place Vote), 1 Point (3rd Place Vote). In the case of a tie, Chris Rubio will break the tie with his vote. 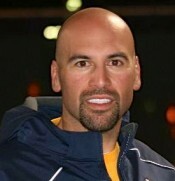 *All statistics will have to be verified by your high school head coach before you can be announced as a Finalist. 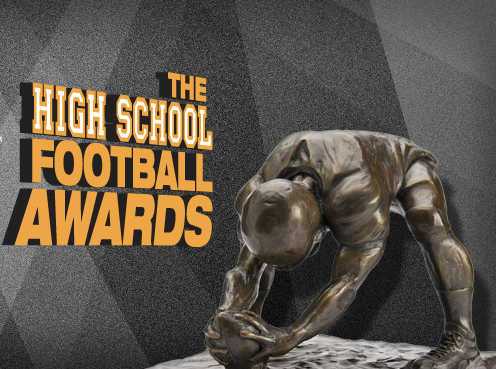 I know you already follow me on Twitter (if not, focus up) and now you will also want to be sure to follow the High School Football Awards Twitter account here for updates and like the Facebook page here for up to the minute information. 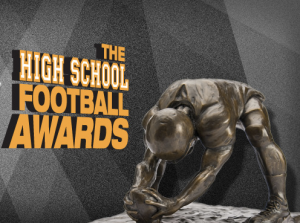 You can also access the site by ChrisRubioAward.com or HighSchoolFootballAwards.com (both hit the same sight).